By day, Anna Caig manages the media relations team at Sheffield City Council, walks up hills in the Hope Valley and takes care of her two amazing and very cheeky children. But by night, she loses herself in the world of reading, and writing about reading, that is Murder Underground Broke The Camel's Back, her beloved book review blog. In March 2015 I visited the amazing Salts Mill bookshop in Saltaire, and bought Murder Underground by Mavis Doriel Hay. It looked fantastic, so up my street it is untrue. But I took it home, and it joined a shelf of ‘to read’ books. Which was just one of many shelves of 'to read' books. So Lambeth Council have presented an ‘exhibition’ of their plans for the future of Carnegie Library in the church hall of St Saviour’s on Herne Hill Road. The word exhibition has been misused in my opinion. The council have provided the community with poster boards which contain little more information than the leaflets of spin regularly pushed through my door. So no change there. I cannot even bring myself to provide a photograph of their display as it is so pathetic in my view. But if you really want to see it you can take a look at the great pictures on BrixtonBuzz. To say I am angry about this is an understatement. After all, it’s what I’ve come to expect from this borough’s handling of the whole abominable situation. I’m now so distrustful of Lambeth and how they deal with the community that I even resorted to photographing my response card so that I have a record that it actually exists. 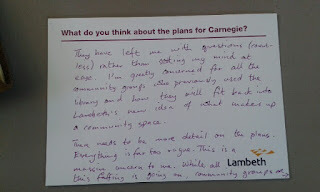 It seems a lifetime ago that we were forced out of our beloved Carnegie Library but it’s only been 2½ months. We’ve more or less settled into The Cambria but it is not ideal for our club as it is first and foremost a pub. This was made very evident when a session had to be hastily rehomed in lead tutor Caroline’s house (living room, garden and kitchen) as the pub was having its floors re-sanded. Our residency at the pub is further threatened by the arrival of Euro 2016. Then of course, once the football is done and dusted Wimbledon will strawberry and cream its way onto the scene. We always knew The Cambria could only ever be a temporary solution and Caroline has been searching out alternative venues. The best options have been narrowed down to a wonderful room in The Camberwell Bus garage or St Faith’s on Red Post Hill. So we conducted our very own version of the IN/OUT campaign and voted for one of the venues. So, it’s six months into this crazy Goodreads 100 book challenge I set myself and I’m happy to report that I'm now two books ahead. This is largely due to the fact I’ve also been reading children’s books at breakfast. Without this saving grace I believe I’d be whimpering in shame at this point. “But is this reading of children’s books thing allowed?” I hear you all asking. As I work with children, primarily instructing them on how to improve their creative writing, it is only fitting that I check out the books deemed to be totally read WORTHY by the kids and also by those who reckon they’re in the know. It will come as no great shock to you that I have disagreed with the Know-It-Alls from time to time but NEVER with the kids. So who are my protagonists and why do I want to write about them? To answer this question I have to look at who they are. The first and most obvious thing to note is that all but one of my protagonists is female. I’m not against a male protagonist. I just understand what it is to be female and so write what I know. Now time to take a closer look at my characters and why I create them.